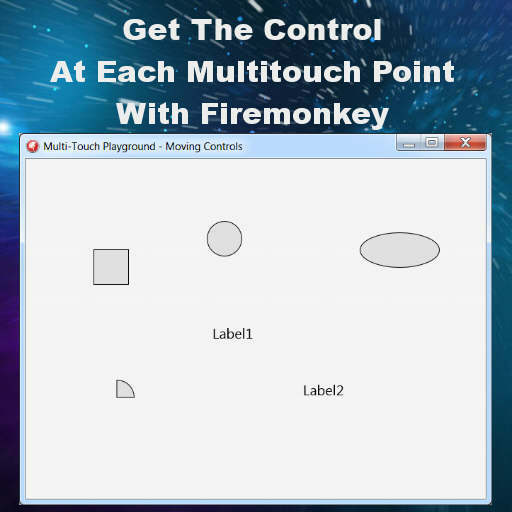 Developer Simon Stuart from LaKraven Studios has a two part article posted which demonstrates interacting with multiple controls using multi touch at the same time in Delphi XE7 Firemonkey. There are multiple code snippets and a download download for you to check out. Basically in the example you can touch each control with a finger at the same time and move them around. The code snippet breaks the OnTouch event out into separate events which are TTouchAction.None, TTouchAction.Up, TTouchAction.Down, TTouchAction.Move, and TTouchAction.Cancel. The other really useful code in here is the functions GetControlAtPoint and GetControlsAtEachTouchPoint. Those are the functions you need to find out what control is under each touch point. You should really read through both articles to familiarize yourself with how multitouch works and what you might have to work around as the TTouchAction.Up isn’t always fired in order (but Simon provides a work around). Stay tuned for the third article from Simon on the subject. This code should also work with Appmethod. Head over and check out Working With Multi Touch Input In Delphi XE7 (Part1). And then head over and read Working With Multi Touch Input In Delphi XE7 (Part2) before downloading the included source code demo.